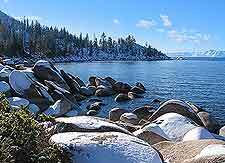 Lake Tahoe is one of the finest lakeside communities in the US and is a popular place to buy or rent vacation property. The lake straddles the California-Nevada state line, with homes for sale on either side. It doubles as both a summer activity escape and a winter ski resort town, so there is no off-season as such. Residents enjoy access to this deep-water lake and its impressive water sports potential. Casinos populate the south shore, while the west side is rugged and old fashioned. 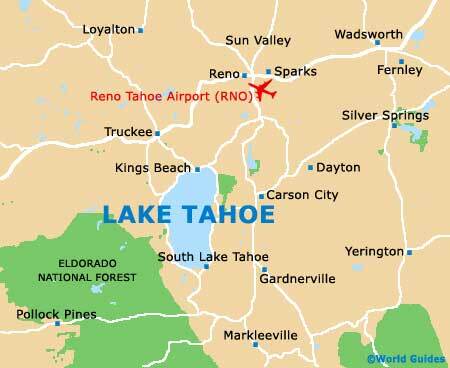 Most of the development is on the south shore of Lake Tahoe, which is completely contained within California. Listing prices for property in Lake Tahoe are expensive, and they rose steadily through the early 2000s until they topped out in 2006. More recently, the recession has affected prices in this area, though not to the extent that it did in the rest of California. Generally, prices appear to be holding slightly below their 2006-2007 highs, with some indication that they will rebound in the near term. Most of the serviced apartments in Lake Tahoe are on the south shore, in an area that has the most development. These are highly commercial units in reach of the best entertainment options. They are priced above standard unfurnished apartments, though they offer a good value compared with short-term hotel rooms. The north shore has a more resort-oriented infrastructure, with an overall rustic appeal. Serviced apartments and villas are located here, but they come at premium prices. The level of service is highest on the north shore, and the clientele are typically affluent retirees and well-heeled vacationers. Also, being located in Nevada, the property here is subject to slightly different laws than the properties located on the Californian side of Tahoe. On both shores, leases are seldom required, but an upfront deposit is in order. The average price for a square foot of real estate in Lake Tahoe is just less than USD220. This works out to around half a million dollars for a standard free-standing cabin on the lake. Condominiums cost less, but are still relatively expensive. Timeshares are the best value for vacationers who want to spend part of the year at Lake Tahoe, but aren't compelled to buy a complete unit. Closing costs around Lake Tahoe follow California state regulations. While high compared to other states, these are still low for the buyer by global standards. Title work, mortgage origination and miscellaneous inspections usually total 1.7 percent of the purchase price. Closing costs on the east (Nevada) side of the lake are lower, at around 1.5 percent. It is important to find a knowledgeable real estate agent, as each shore of Lake Tahoe is dramatically different from the others. An agent who understands your needs, as well as market trends and different 'state' dynamics, will be able to guide you to an ideal property to buy or rent. Property lawyers are important when seeking timeshares. Tavern Properties overseers a community of lakefront holiday residences that are available for sale or rent. A European based realtor, Squaw Valley Accommodations has a selection of cabins for rent in the mountains and on the lake. They also feature for-sale properties. Paradise Real Estate specialises in timeshare properties in South Lake Tahoe.